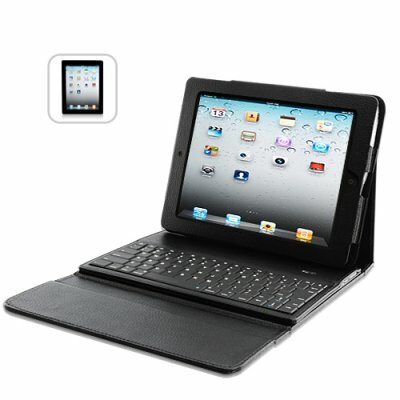 Successfully Added Leather Case for iPad 2 and 3 - Removable Bluetooth Keyboard to your Shopping Cart. on 2011-08-05 18:20:56 Pretty good product! It's strange that as far as I can see, no retailers outside of China carry this kind of product combination. The Bluetooth keyboard seems to work just fine. I think there is a slight convex bend in it, and the small keys demand proper attention (particularly the right Shift key which is noticeably smaller than the left). But other than that, I am pleased at this value. The case is all right too, but given that it is meant to accommodate BOTH the iPad 1 and 2, the fit is not great. Because the iPad 2 does not fit snugly, the view out of either the front camera or the back is obscured by the rim of the holes. So if the cameras will be used at all, one might want to either widen the holes in the leatherette case or perhaps buy an additional rubber skin for the iPad 2 to fill out the space.